QUINCY — Three days after a vicious nor’easter pounded coastal neighborhoods here with heavy flooding and near-hurricane winds, wreckage lay scattered in the mud-coated streets leading to the Houghs Neck peninsula. Generator-powered pumps sucked saltwater from flooded basements and emptied it into the street. Shattered fences and broken trees littered yard after yard. And the ruined mementos of a lifetime — photos, jewelry, toys, furnishings — sat in tall, soggy piles on the sidewalks, awaiting a trip to the trash heap. Not even the Perfect Storm of 1991, which hit a month after his family moved to Sea Street, carried such a blow, Brian Bardon said. “My daughter lost everything,” said Bardon, standing near the basement apartment where Kristen, one of his five children, had lived in the family home until 5 feet of water destroyed nearly all her possessions. The 26-year-old is planning a November wedding. Now all the shower gifts she had stored in expectation of starting a new life are gone. 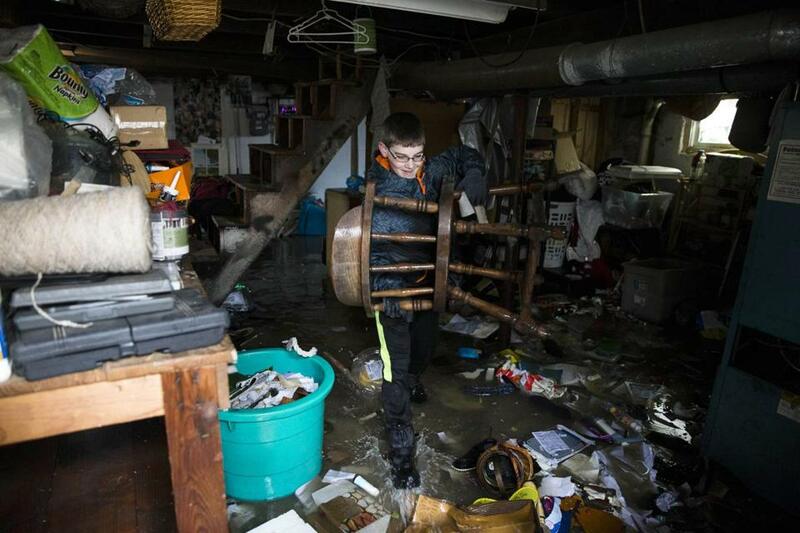 And the basement, where the family trudged through ankle-deep water Monday, was a sloshing, inundated mess. 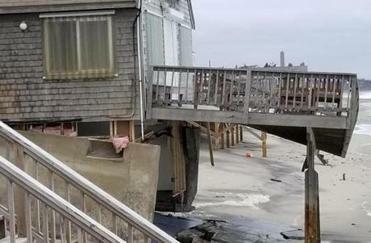 On Cape Cod, one house’s foundation “ripped apart and fell into the ocean” before washing out to sea. As the region continued its recovery from the powerful late-winter storm, Bardon choked back tears as he watched his children and a family friend haul box after box from the basement to the sidewalk. Despite the damage, the family has no plans to move, he said. On Friday, the Quincy Fire Department used a boat to rescue Bardon and two of his sons from the back porch and ferry them to high ground. In all, some 500 residents were evacuated, officials estimated, as flood waters reached as high as 8 to 10 feet. “There was water on the first floor of places that were built on stilts,” said Chris Walker, a spokesman for the city’s mayor’s office. At least $3.5 million will be needed to make emergency repairs to the sea walls, he said. By Monday afternoon, power had been restored to about 90 percent of the 8,000 customers that lost electricity in the city, Walker said. But as the recovery moved forward, a wariness remained about coastal areas’ vulnerability to future storms. “There will definitely be a discussion, not just for next year or next month or next week, but for 10, 20, and 50 years from now,” Walker said. 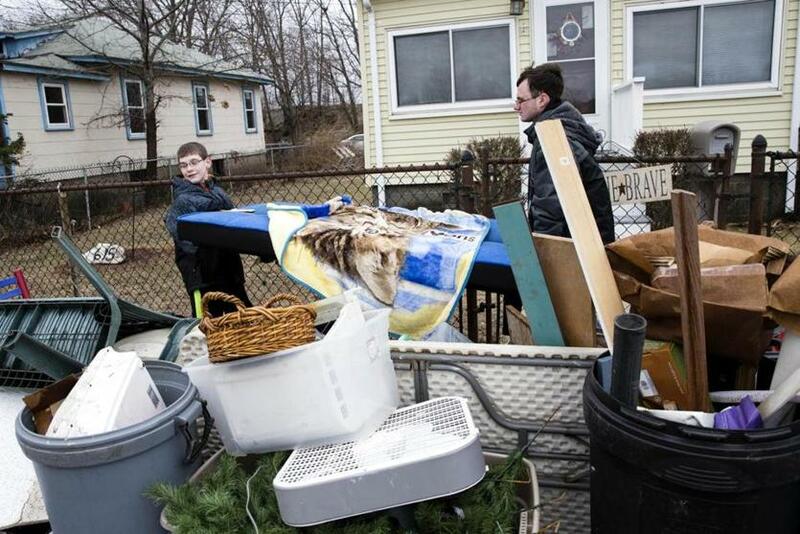 Walter (left) and Ben Bardon piled flood-damaged belongings outside of their family’s Quincy home on Monday. The full extent of the storm’s destruction — the number of houses damaged or destroyed, the number of vehicles crushed or split in two, the number of public buildings in need of repair — has not yet been tallied. While the coast bore the brunt of the damage, the storm reached far inland with sustained winds of 50 and 60 miles per hour. That created a jumble of downed power lines and broken trees from the coast to inland communities such as Easton and Mansfield. The recovery could be hampered by another storm expected to arrive on Wednesday, which forecasters say could drop 6 to 12 inches of snow in Boston and Eastern Massachusetts and bring a storm surge of 2.5 to 3 feet. Winds are expected to gust to 30 to 40 miles per hour, and up to 50 on the Cape and Islands, blowing the strongest from Wednesday night into Thursday morning, officials said. Whitman Fire Chief Timothy J. Grenno said the impending storm is a major concern. On Monday, Governor Charlie Baker said he “absolutely” expects to ask the federal government for disaster aid for the nor’easter. If the storm is declared a major disaster for Massachusetts, state and local governments and certain private nonprofit organizations may be able to have 75 percent of their eligible storm costs reimbursed. On Monday afternoon, 62,000 electric customers in Massachusetts remained without power, down from more than 400,000 during the weekend, according to the Massachusetts Emergency Management Agency. Large-scale outages remained on the South Shore, in Southeastern Massachusetts, and on Cape Cod and the Islands, according to MEMA. In Pembroke, 71 percent of customers were powerless, while in neighboring Norwell, the figure was 76 percent. The nor’easter’s high winds combined with astronomically high tides to affect nearly every coastal community in the state. On Monday morning, 162 people were at shelters or warming centers, according to MEMA. The severe storm, along with the storm that caused heavy flooding in early January, is forcing new calculations about what Massachusetts should expect in the years to come. “The recent storms we’ve seen, and the storms we will be getting, are the new normal for coastal Massachusetts,” said Jack Clarke, director of public policy and government relations for Mass Audubon. “We would recommend a retreat from building along the vulnerable shoreline,” he said. He urged residents in these areas to contact their representatives in support of a bill to allow property owners to sell vulnerable and weather-damaged properties to the state for their appraised price. Under the proposal, the state would buy property in order to “tear those houses down before they wash into the sea,” he said. The bill has passed the Senate five times but has yet to pass the House. Still, Senator Marc Pacheco, a Taunton Democrat who sponsored the bill, is confident. Walter Bardon carried items out of the basement of his family's home. Joshua Miller and Emily Sweeney of the Globe staff and Globe correspondents Laney Ruckstuhl and Margeaux Sippell contributed to this report. Brian MacQuarrie can be reached at brian.macquarrie@globe.com.